Before I even ‘talk food’, I just want to extend a sincere, from-the-bottom-of-my-heart “thank you and grazie” to all of you (100’s of bloggers and social network friends) who wrote to me to offer me your prayers and positive thoughts for the event that took place in my life. Although the situation hasn’t disappeared, my husband and I felt that blogging with my friends about our shared passion for cooking, gardening, and travel . . . is really tremendous therapy for me. I started to read your posts last week to see everything that you’ve been cooking up and I have to still say that you are all some of the best cooks on the planet!! I will get right back to commenting very soon . . . promise! So I’m at a point now where I’m ready to return to my community of friends! I truly believe that all of your prayers and positive thoughts sent my way will be answered in the right way and at the right time! OK . . . it’s foodie trivia time! New York has it’s famous pizza. Chicago has it’s deep-dish pizza and Chicago Vienna Beef hot dugs. Buffalo, NY has hot wings. San Francisco has it’s sour dough bread. And the South has shrimp and grits and pimento cheese! So how about the Midwest; what stands out besides corn on the cob, buttery corn-fed beef or the State Fair’s butter cow sculpture? Well, hold on and I’ll tell you about something that few people outside of the Midwest know of . . . . and it was recently featured in Cook’s Country (Cooks Illustrated) magazine. 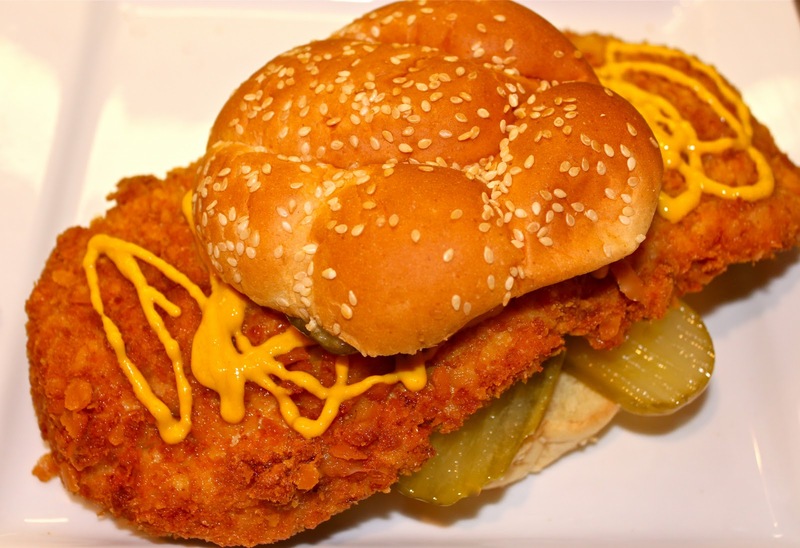 It’s the Breaded Pork Tenderloin sandwich. 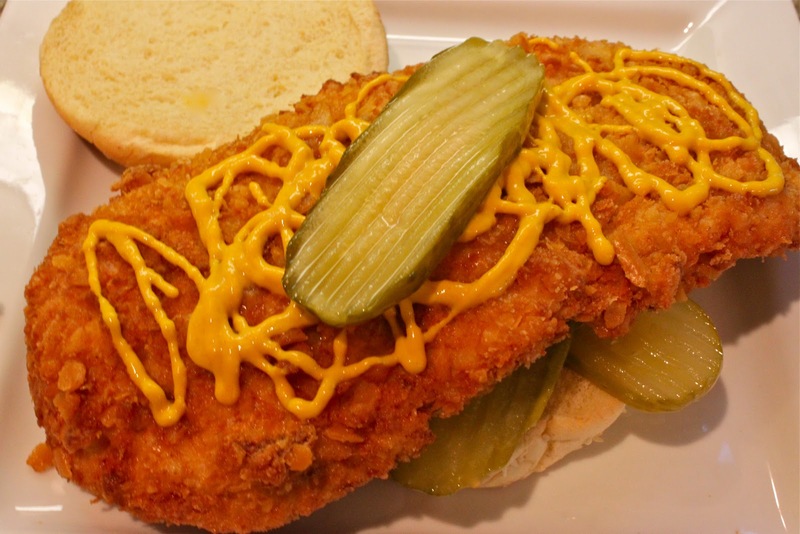 This classic Midwestern sandwich even has it’s own web-site created by a dedicated connoisseur: Pursuing the Pork Tenderloin Sandwich, a discussion/debate on the sandwich on Chowhound, plus a blog, ! The web-site also provides a list of numerous restaurants, diners, and eateries that serve this sandwich. There is even a DEBATE over where the sandwich originated: Was it Iowa, Illinois, or Indiana (the three “I” states in the Midwest)? Well, I have no idea which state it originated from, but I know that there are more hogs in Iowa than there are people, so I’m voting for Iowa as the source . . . I’m just sayin’! No offense to any of my friends and relatives in Illinois and Indiana! Besides Iowa doesn’t have any professional sports, so give it some credit for something besides Maytag Bleu Cheese and Amana appliances! Many of you know that my roots are from the Midwest. My parents’ restaurant (Italian and American food) used to have these sammies on their menu and they sold as fast as hot dogs at a baseball game. Every summer I had to have one when we’d stop at a roadside diner half-way through our 4-hour drive to Lake Okoboji in Iowa (up at the border of Minnesota). It was a ritual !! And this year, for the first time during one of my annual summer visits to Iowa, I brought back some super-sized pork tenderloins for this sandwich. It’s been a LONG time, maybe even 10 years since I’ve had one of these guys! – It must be huge, twice the size as the bun, and hanging out all over. “think outside the bun” ha ha! – It must be a tenderized piece of pork tenderloin and not some tough pork ‘chop’. – It must be served with mustard and pickles; other condiments are OK, but not necessary (lettuce, mayo, onions, tomatoes). Use even amounts of each of the following (start with one cup each) . . . depending on how many tenderloins that you’re breading, just make up more breading if you need to. These amounts also depend upon how many tenderloins that you’re marinating, just make up more batter if you need to. Pour into a ceramic/glass baking pan. Place the pork tenderloins in the wet batter. Cover and marinate in the refrigerator OVERNIGHT — this really makes them tender, tender! Prepare the dry breading mixture in a large cake pan or something similar because these are BIG and need the space for the breading process. Remove tenderloins from the marinade and place in the dry breading, lightly pressing down so that the breading gets into all of the crevices of the tenderized pork. Gently flip over and repeat. Dip the breaded tenderloins ONCE AGAIN in the marinade and then double-dip them again in the breading!! It may be messy, but it will really be BREADED thickly! Heat canola oil to 350 degrees. The oil MUST be hot. Deep fry in a deep cast iron pan (I use my Le Crueset) or in a deep fryer (which I don’t have). Place on buns with pickles and mustard. This bad boy was so big, that Mr. M. and P. (meat and potatoes) split it with me! Sun-Dried Tomato Pesto Turkey Burgers With Basil Aioli and A Major Southern Snow Storm! I am SOOO happy to see your return 🙂 and remember our thoughts and prayers are always with you! That sandwich looks amazing and I know my family would go nuts for it, I can’t wait to make this! Thanks for an amazing recipe! I’m so happy that you are back. I hope your situation improves. Pork sandwiches? Anything with pork is good. We just had pork carnitas. Yummy! I’m so happy to see that you’re back and enjoying some good food! I’ve been thinking of you and hoping things are getting better. Hang in there, Roz! So glad you are back and this sandwich look insanely delicious! 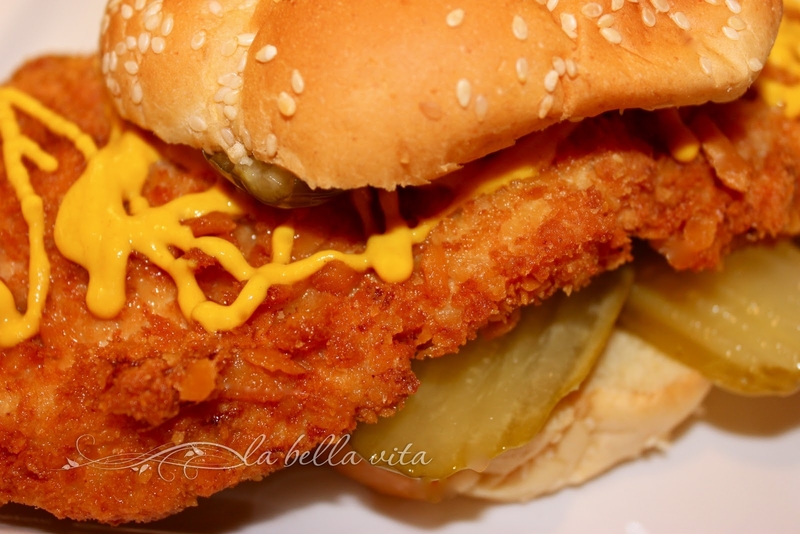 Something about the combination of pork, mustard & pickles – wow! My husband would go nuts for this too – thanks for sharing and I hope you are feeling better – Big Hug!!! Ciao mia amica! What happened? I must have missed something terrible that happened. Is everything okay now? I am so so sorry!!! My thoughts & prayers are with you. Hugs!!! This recipe looks really good!! I was just thinking of you yesterday when I scrolled by your blog name in my Google reader. Glad to see you back. The sammy looks like heaven! Happy to see you back cooking and posting these lovely recipes! Welcome back! that’s one heck of a sandwich, I could munch that down right now actually..
Roz! My goodness. My heart skipped a beat when I saw a blog post from you in my feeder. So great that you’re back on board. I hope everything is sorted now. That sandwich is something else. I have pork leg steaks in the freezer and I think they may be made into these. Welcome back Roz. The sandwich looks super good and I like rule 1 for all sandwiches. Glad you’re feeling like blogging! Missed your stuff . . . and this recipe is proof positive. I am so happy to see you back on these pages Roz. There is nothing like kitchen and blog therapy. I had a chicken version of this sandwich when I was in Ontario this summer…and to say the breast was 3 times the size of the bun is no exageration. Yea!!!! You’re back. Although I don’t post recipes here, I adore your blog, and have made some of the wonderful foods on here. Welcome back!! And what a way to come back…what a sandwich!! Hello! I’ve never commented on your gorgeous blog before, but I’ve loved your posts and recipes. Delighted to see your words again! Isn’t it interesting that this sandwich MUST have mustard and pickles, which [I think] is also a requirement of the Cubano? Pork, despite its versatility, seems to cry out for certain flavors. Have a great day. Thanks for making so many people happy! Glad you are back, Roz. Missed you! I’ve been checking every day. So glad you are back. You were truly missed. Welcome back, Roz! Hope things will get better for you, soon. That sandwich is incredible and is making my mouth water! That sammie looks completely AH-MAZING! First of all I am so glad you are back- for the most part. again, I have no idea what has happened but I know I love sharing the joy you get from talking about food and recipes and I for one and so exited to hear from you again. What a winner you chose to as your first back to blogging post. This sandwich is fantastic. I love breaded meat sandwiches and this tops the cake! It is so great to meet you! Thanks for commenting and following, right back at ya! That is a crazy sandwich, just up my foodie alley. Hope you enjoy the figs and I am sorry to hear you are going through some struggles. It seems to be rampant these days, I can relate. I do hope that life gets better for everyone soon. We could all use it! Until then, continue with the double battering, LOL, love it! Wow, that’s a great looking sandwich! Great post. Oh, and I do hope everything’s fine as I was reading the earlier comments. Thanks for sharing! Doesn’t it just make you warm and fuzzy by all the blog love that is out there. My blogger friends help ease my own personal pain, during some personal losses. It’s nice to see you are back. You are family. As for the sandwich– Holy Schnitzel! My husband is from the midwest. I’ll have to ask him about this sandwich. Better yet, I can guarantee I’ll make it. I always buy pork tenderloins, and I’m a huge fan of Cook’s Country. This isn’t low-cal, but who cares? Sometimes, ya just have to live it up. Looks crunchy and golden. I am so glad that you are back blogging! This recipe post looks delicious. I have never had this tasty sandwich and it is a nice change of pace. Well done. This is the best news I’ve had in a long time. You are back! I am so glad. I’ve missed you terribly. I’m so sorry I wasn’t the first one to get here to tell you so. Lots going on up my way and I haven’t been out-and-about as much as I would like. This sandwich is something. I’ve never seen anything like it. Would love to dive right in. Again Roz, so so very happy to see you back in our world. You’ve been on my mind. Hope things continue to improve and your life gets back to normal very, very soon. Welcome back! I am still praying for you and happy to have more delicious recipes to try!!! So good to see you back, Roz — You were missed! This sandwich looks so mouth watering fabulous! Roz, I’m so glad you’re back! You know, no matter what happens to us, we must eat! And you’ve shared a great recipe with us. I can’t wait to try it. I’m so glad you’re back Roz..
..and I’m glad you’re back with that delicious sandwich! I am so excited to see you today! Welcome back, we missed you so much and are so happy that you are back.Your sandwich looks so delicious. I know I would really love that sandwich. I still have you on my prayer list and will continue to keep you in Gods arms. Roz!!!! Hooray!!! I’m so glad to see a blog post from you. I hope you know how much we missed you. Wow, you made this perfectly! So crispy and wonderful. I know my boys would go nuts for this. I’m so happy to see that you are back here! We all missed you and your amazing recipes and gorgeous pictures. Welcome back! I am so happy to see you back online! You were missed. Pork tenderloin sammie looks awesome! Welcome back. I’ve MISSED you!!! Yeah!!!! So glad your back!!!! Hi Roz, So happy you are back and sharing your love of food with all of us. Sometimes we need to keep on doing things we love in order to heal. Thanks for sharing the sammie, it looks delicious. Hi Roz 🙂 I was assigned your blog for the Secret Recipe Club, and I chose this delicious sandwich to share on my blog. I love your site and the wonderful recipes you share. Here is the link to my post. I am just no longer sure where you’re helping your data, although beneficial subject matter. My spouse and i needs to commit quite some time mastering far more and also working out a lot more. Thank you for fantastic information I had been trying to find this info for my mission.